Inertia is a powerful force. Once a certain way of doing things is established, it tends to stay that way long past its welcome or usefulness. Unfortunately, capabilities and support for credit union cloud services are beset by inertia. Moving into the cloud requires a shift in a credit union’s strategy and culture. That shift can be aided by a few critical cloud services. In this blog, we’ll identify four services designed to help credit unions move into and take advantage of the cloud. While there are many cloud services to choose from, some more complicated than others, we’ll focus on four today. Each of these services is designed to address a need that credit unions might have when migrating to the cloud. So, without further ado, let’s look at those pillars. Managed cloud production services for credit unions is essentially the way a credit union moves to the cloud. Plus, it’s not just “the” cloud, but also “which” cloud. The cloud is basically just a decentralized data storage network. Credit unions can choose who hosts their data, whether it be Amazon Web Services (AWS), Azure, or Ongoing Operations. 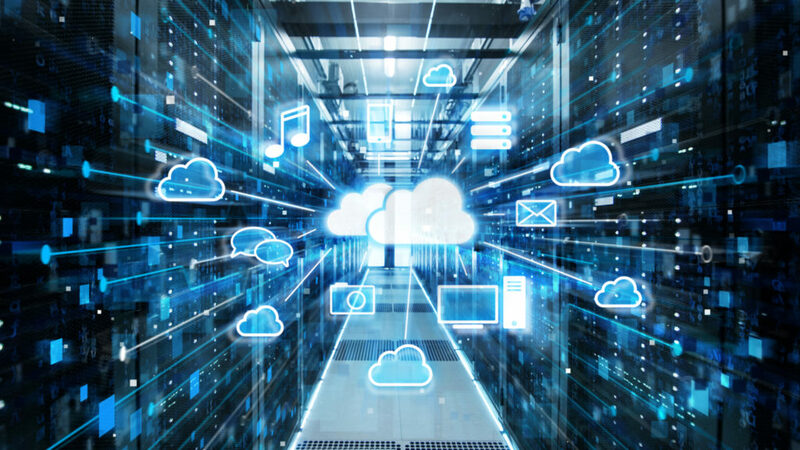 Choosing a managed cloud production service is the first step toward moving your credit union to the cloud. If you can find a cloud production service who can ensure and manage secure migration, all the better. Because cloud data is decentralized and network-based, it’s important to make sure that your data is safe. Managed telecommunications services for the cloud can address data transfer security concerns. Cloud networks raise concerns about native vs nonnative encryption protocols in common applications. In order to meet NCUA standards for credit union information security, you may want to consider encrypted MPLS and VPN capabilities. One of the benefits of moving to a hosted solution for cloud telecom is that you won’t have to worry about particulars. Maintenance, warranties, troubleshooting, replacement, etc. can be taken care of by your managed cloud provider. One of the primary benefits of moving to the cloud is that it makes disaster recovery much simpler. The decentralized, redundant data storage shines when something catastrophic happens. Managed disaster recovery services are as much about managing backups as it is about protecting important data. When credit unions use offload disaster recovery services, they don’t have to do chain integrity checks on their own, nor do they have to worry about damaged equipment. Finally, all the infrastructure is taken care of. Instead of directing resources toward maintaining air conditioners, generators, power supplies, and so on, credit unions can essentially subscribe to a disaster recovery service that handles those at a reduced cost. The last important piece to the puzzle of managed credit union cloud services is the managed security aspect. Most credit union IT departments are well-equipped to handle security on their own. However, it does take considerable time, resources, and expertise. Ultimately, managed security services for the cloud are cheaper through a vendor. Plus, vendors have the responsibility to keep their security top-notch. Managed security for cloud services means aggregating one big, robust SIEM. All individual devices log into one centralized location, cutting off access to questionable outside sources and improving overall security. What’s Right for My Credit Union? What works for your credit union and what might work for another credit union are going to differ. The best thing to do is to assess you own needs and move from there. Any of the above pillars of managed cloud services for credit unions might fit the bill. If you’d like to learn more about credit union cloud services and information security, follow the links below!